Brilliant timing from your correspondent means that this Vuelta preview is nothing if not topical. Today it was announced by his Lampre Merida team that 2013 Vuelta champion Chris Horner would not be starting this years edition. Withdrawn due to rules surrounding his cortisol values (he has been suffering from bronchitis), Horner’s non-start caps what has been a pretty awful year for the rider following a serious accident while on a training ride earlier this year. Of course this begs the question; could Horner have defended his title in 2014. The answer is probably no, but it’s terrible news for rider and team as neither have made much of mark this season. 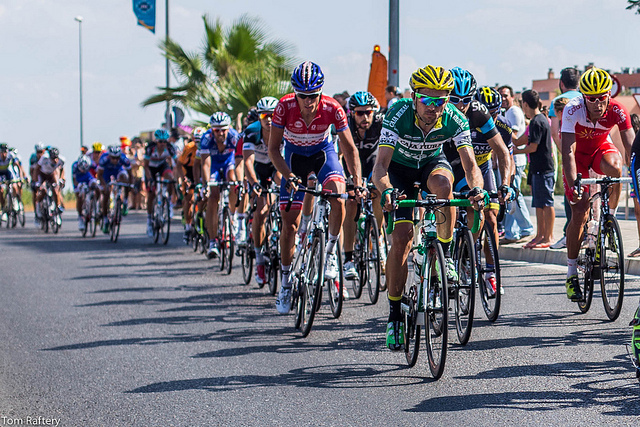 Vuelta a Espana 2013 – who’s going to win this year? A huge factor effecting a possible Horner title defence in this years race stems from the appearance of a number of riders who under different circumstances would not even have considered riding in Spain. First we have the ‘re-match’ between two protagonists who were meant to duke it out in this years Tour de France. Chris Froome and Alberto Contador both crashed out of the Tour (Froome on the ‘Roubaix’ stage, Contador in the Vosges) fairly early on and while it was clear early on that Froome would attempt to salvage his season at the Vuelta, Contador has had to battle back to fitness from his own accident that occurred later in the same race. It will be interesting to see how Froome goes at the Vuelta. He has good form at the race, finishing second in 2011 where many people thought he could have won if given his head earlier in the race where he had to ride for Bradley Wiggins (the source of some of the enmity between the two riders). After riding for Wiggins at the Tour in 2012, Froome was given outright team leadership duties for the first time in that year’s Vuelta, but struggled with fatigue and against a resurgent Contador who was returning from his clenbuturol ban. Can Froome go one better than 2011? It’s certainly possible. Sky need something from the final grand tour of the year after abject performances at the Giro and Tour and Froome hasn’t added much to his palmares in 2014 other than early season wins in Oman and the Tour de Romandie. If 2014 isn’t going to turn into Sky’s ‘worst ever’ season then Froome will have to do nothing short of winning this years Vuelta. Under different circumstances it’s hard to imagine the team placing that much importance on the race (Sergio Henao as team leader in 2013 ring a bell?). Certainly since their maiden Tour victory with Wiggins it’s been clear that Sky’s focus is Tour centered and even if Froome goes well in Spain this year it’s unlikely that his team will put as much into next years race. There’s potentially more pressure on Froome to deliver as a result and his form and fitness will surely be a deciding factor as much as the route and the competition from other riders in the peloton. Nevertheless, VCSE still picks Froome as one of the favourites for the GC in 2014. For the other rider crashing out of this years Tour Alberto Contador the pressure is lower. The fact that he will manage to make the start line is an achievement in itself and expectations will be lower for the Tinkoff Saxo team leader. Contador’s team had an outstanding Tour considering the loss of their principal rider with stage wins and the emergence of Rafal Majka as a big star (and KOM). This doesn’t mean that Contador will line up just to make up the numbers at the Vuelta, but if he isn’t in contention for the GC, there is a lot less riding on the race for Tinkoff than for Sky. As with Froome, the key thing will be Contador’s fitness; has the rider recovered sufficiently from the knee injury he sustained in July? If he has and can rediscover the form he showed earlier this year Contador will be locked on for at least a podium, if not the outright win. There’s another factor in this years GC line up that may reduce Froome and Contador to be fighting over the left overs. 2014 Giro d’Italia champion Nairo Quintana will race this years Vuelta and could be the rider best placed to take victory. Last years Giro winner Vincenzo Nibali was unable to do the ‘double’ fading on the penultimate stage and it will be interesting to see how Quintana manages this year (form and fitness again a question mark?). The Colombian has been almost invisible since his maiden grand tour success so it’s not easy to assess his condition for the Vuelta but a Quintana in the same form as the one who rode the Giro ought to be a favourite for victory here, but for one fly in the ointment in the shape of Alejandro Valverde. Valverde never really threatened the lead at the Tour and faded badly in the final week. It’s hard to imagine Movistar denying him a place in their Vuelta team, but of the riders mentioned so far Valverde would have to be the least likely GC winner and it seems perverse to include Quintana and Valverde in the same squad as this inevitably divides finite resources. This leads to speculation around who leads the team. VCSE’s view is that Valverde is the wrong horse to back for the GC, the teams future is Quintana and the older rider can do more damage to Movistar’s GC rivals by attacking on key stages to tire out the likes of Froome and Contador. Whether or not this comes to pass remains to be seen but Quintana (with the caveats already mentioned) would be the VCSE tip for the win this year. Among the other contenders is another rider looking to salvage their season. Purito Rodriguez like Chris Horner is suffering from an early season crash and hasn’t really got back into shape since the spring. It’s unlikely that his fortunes will change here. He looked out of sorts at the Tour and it’s really too soon afterwards to imagine him having much more than an outside chance of a podium. There’s further Colombian interest in Rigoberto Uran and Carlos Betancur for Omega Pharma Quick Step and AG2R respectively. Uran will top ten for sure, but there’s the normal composite feel to the OPQS squad and the relative lack of support will most likely deny him a podium. Betancur is altogether harder to predict. After his breakthrough win in this years Paris Nice he’s proved to be something of an enigma, missing the Tour and even ‘disappearing’ at one point. Betancur was poor in last years Vuelta after a decent showing at the Giro. It’s difficult to say how he will run this year, but suspicion has to be that he won’t trouble the top five. Belkin bring a strong team to the Vuelta and should be looking for at least a top ten finish from Wilco Kelderman. With Robert Gesink and Laurens Ten Dam in the squad it’s possible that the team prize will head Belkin’s way with all three riders capable of finishing high on the GC. Astana bring another Giro surprise package in the form of Fabio Aru. Aru has plenty of potential, but it would take a special performance to break into the top five here. Trek could be looking to pinch the leaders jersey on the opening stage team time trial with a strong outfit that includes Fabian Cancellara. MTN Qhubeka have finally secured a grand tour wild card and it will be good to see the African outfit at this year’s Vuelta. Recently announcing a tie up with Cervelo for next year it’s more likely that we’ll see their jersey in the break, but Gerald Ciolek could feature if he can get away towards the end of some of the rolling stages. Outside the GC the sprinters and points battle should be interesting. Peter Sagan, finally confirmed as a Tinkoff Saxo rider next year, will have his swansong with Cannondale. Sagan faces off against 2014 Giro points winner Nacer Bouhanni, another rider switching teams next year (from FDJ to Cofidis). Giant can pick from any number of strong sprinters in their roster and John Degenkolb should be their go to guy for the flat stages. However, Giant have also selected a bit of a composite team with double stage winner from last years race Warren Barguil in the team also. Barguil has a bit more support this year, but now he’s something of a known quantity it will be interesting to see how he goes. The likelihood is that this years target is a high GC placing rather than outright stage wins, which responsibility will probably fall to Degenkolb who went three better than Barguil in 2012. 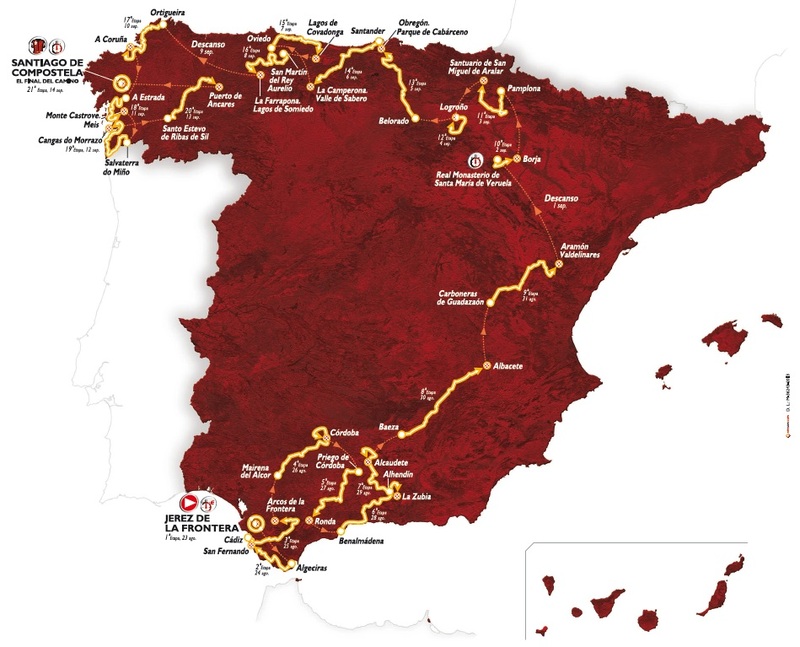 There’s quite a few changes to the route in this year’s Vuelta with a few old favourites returning but the Angliru missing along with the final Madrid sprinters stage. Instead the parcours starts in the south for the first week before a series of ‘transfer’ stages moves the race to the north heading from the west around Pamplona towards it’s final destination the pilgrimage site of Santiago de Compostela. There are four stages featuring cat 1 and HC climbs, but there’s a further eight stages classed as medium (even these have cat 1 climbs!). It’s a typically tough Vuelta route. We’re likely to see a sprint finish on four stages, but there’s plenty of scope for breakaway and solo wins on a number of stages. The Vuelta always manages to throw up some dramatic wins and no doubt there will be more surprises in this edition. Unfortunately seen as the poor relation among the grand tours and further shadowed by the unpredictable events of this years Tour, it’s good to see that the formula of the last couple of years has been ditched. The combination of an interesting field and a different route should deliver another exciting race in 2014. Stage 20 – Santo Estevo de Ribas de Sil to Puerto de Ancares: a monster HC summit finish for the final GC battle. Can this beat the Angliru for drama?